At Timeless Treasures, our goal is to not only help you liquidate the household items, but to make the process easy and stress free. We provide all of the resources needed to conduct a full-service, turn-key estate sale. We're energetic and hard working. Our attention to detail and expertise at pricing will get you the best value for your items in a short period of time. We're a family run company and we do not oursource or subcontract employees. We are well known in the community and have ties with the local Police, Fire & EMS. Estate Sale - FLASH Sale - Entire House! STRATFORD - LARGE Estate Sale - NEON ON SALE! Large Estate Sale - Antique, Vintage and New! Collector's & Tools Estate Sale! Grand Estate Sale - New and Vintage! Estate Sale - Vintage and New! Estate Sale - Antique, Vintage, New and Fine Quality Items! Estate Sale - Fun and fabulous finds in Monroe! Estate Sale - Something for everyone! Estate Sale - Vintage, New and Fine ART! Estate Sale - Packed in Branford! Estate Sale -Vintage and New! MONROE ESTATE / MOVING Sale - something for everyone! Estate Sale - Antique, Vintage and New! Estate Sale - 60+ years of treasures! Estate Sale - Fun and Fabulous finds! ESTATE / MOVING Sale - something for everyone! Estate Sale - Shelton - Picker's Paradise! Estate Sale - Tool Alert! Estate Sale - Mid-century retro and new! Estate Sale - Tons of stuff! Estate Sale - Packed Estate! LARGE Estate Sale - something for everyone! Timeless Treasures - Sale at the Barn! Estate Sale - Downsizing - Beautiful home, beautiful neighborhood in Norwalk - Don't miss it! 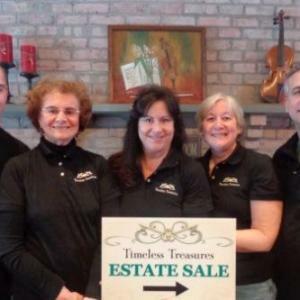 Timeless Treasures - Grand Estate Sale - don't miss it!